Q: What is the difference between softening water and filtering water? You don’t have to be a hydrologist to understand the basic principles behind water filtration and water softening. Here’s an abridged version of what happens when you filter or soften water. Filtering water involves separating mineral particles, like particulates, iron, hydrogen sulfide or other organic matter, from H2O. By passing water through a “filter bed,” or “media bed,” these granular particles are trapped – and clean water passes through the bed. Softening water involves something called “ion exchange” to remove dissolved minerals – like calcium, magnesium, iron and manganese – that can’t be trapped in a filter bed. Softeners use fresh resin beads with sodium attached to the resin. As water enters the tank, dissolved calcium and magnesium are attracted to the resin. The resin passes up the sodium in exchange for the dissolved chemicals and the water is then rid of these impurities. Whether you use a filter or a softener depends on whether the contaminates in your water are particles or dissolved minerals. Culligan® Water Filters remove the substances from your water that can cause staining, foul odors, and the need for excessive cleanup. Household chores become easier because your water is working with you, not against you. To find out what’s ailing your water, contact your local Culligan® Dealer for a free water analysis, or our free water test kit. Q: What should I consider before buying a water treatment solution? Having your water tested will help you determine your exact needs, even though you may already know you have one or more water problems. So do you have hard water? Find out. Click here to learn how to have your water tested. In determining your needs, a water expert will look at a number of things. For example, the hardness level of the water and the size of your family will influence the size or type of equipment necessary for water softening. Additional problems may require additional equipment solutions. The same principles hold true for drinking water systems. Your water usage and pressure. The amount of water used as well as water pressure are factors to consider when fitting your home with a water quality improvement system. Household size may influence consumption, but different families have different needs. Every factor should be considered, including family growth and guest visits. Fixing your existing water problem is your primary goal, but don’t be eager to settle for the least expensive solution. A higher-priced unit may serve your needs better by being more efficient, and reducing operating costs and maintenance time. Be sure, however, that you’re getting your money’s worth. Before you buy, get a detailed estimate of equipment, installation, and operating costs. A reputable water quality improvement equipment dealer is an excellent resource in helping you determine your water conditioning needs. 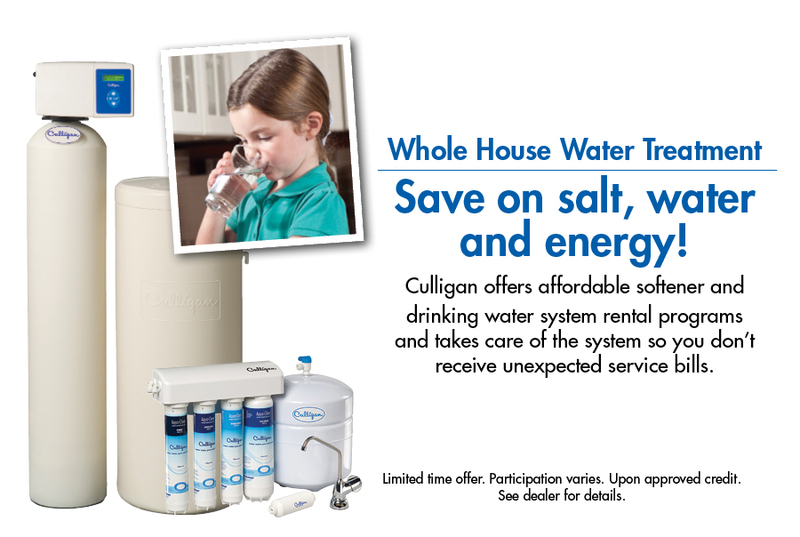 Culligan® is the most trusted name in water treatment solutions. Q: What questions should I ask when I have decided on a solution? Choosing the water quality improvement system that’s right for you and your family does not have to be a chore. Here are some helpful considerations you may want to take into account before purchasing water treatment systems. Does installation include such things as a bypass for lawn and garden faucets, a faucet for unsoftened water or any other features you may want? Does the dealer you’ve selected have an established business in the area? Does the dealer have customer references available? For health related problems have you had your water analyzed by a reputable laboratory and/or your local health department? Q: What is point-of-use (POU) and point-of-entry (POE)? Water filtration is a multi-billion dollar industry, providing millions of consumers with point-of-entry (POE) products – which are typically installed to treat the water used within a single building – and point-of-use (POU) water filtration products – which treat only the water intended for direct consumption. Just look at the spectrum of POU products and services offered today – countertop drinking water filters; faucet filters; plumbed-in single tap filters; pitcher filter systems; refrigerator/icemaker filters; shower filters; and even a personal bottle water filter! View Culligan’s plumbed-in single tap filters or our line of faucet filters. Then there is the whole gamut of bottled water also considered POU – from single-serving bottles to gallon-plus bottles of spring water, distilled water, and pure drinking water. plumbed drinking water cooler that offers the taste of bottled water and convenience of a cooler, without the bottle. From residential to commercial, there is a POU solution for virtually every situation. Q: What is Culligan’s 100% Satisfaction Guarantee? Q: Have Culligan products received any endorsements? Culligan® water softeners, whole-house filters and drinking water systems have received the powerful Good Housekeeping Seal of approval. In addition, the Culligan Gold Series™ water softener has been named as a Consumers Digest “Best Buy” by Consumers Digest magazine (August 2003). softeners… Its Quadra-Hull™ tank has four layers that resist rust and corrosion, so much so that the tank carries a limited lifetime warranty. The Gold Series and Platinum Series “Accusoft® Plus” microprocessor offers precise regulation. Varying tank sizes allow customization to the homeowner’s particular needs. The optional “Aqua-Sensor®” monitors the chemistry of the tank so it regenerates only when needed. Q: Is financing available for Culligan products? various financing options available for Culligan® products and services.